Sadhana Paranji founded Sadhanalaya School of Dance in 1992, in New York, a few months after she arrived in the U.S. from India. Today, Sadhanalaya has grown into a dynamic and successful institute for classical dance where over a 500 students have learned the dance form Bharatha Natyam and Kuchipudi, and about 55 students have graduated and gone on to their debut performances (arangetrams). The institute has won numerous dance awards, put on a countless number of shows in the region with its students, and continues to be innovative in its choreographies, shows, dance ballets, and the new classes it offers. Sadhana Paranji, the Artistic and Founding Director of Sadhanlaya, has the unique combination of a Masters degree in Dance from India as well as experience in both dancing and performing for over thirty years. An exceptionally gifted dancer and teacher who connects deeply with her students, Sadhana has a special ability to communicate her joy in her chosen art form to her students and audiences. For her, dance is a form of joy, and is her life and passion. She spares no effort in working towards her goal of sharing her own fulfilling experience in dance with her students, her community, and her audiences through her teaching and her performances. Sadhana’s students have won several local, regional & national competitions. 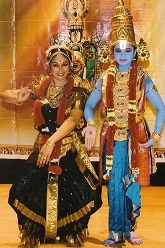 Basava International of New York, awarded her the title of Nritya Kala Praveene in 1992 and Natya Shiromani in 2007. She received the title of Natya Kala Vipanchee from Vipanchee Fine Arts in Dec 2007 and title of NATYA KALA SHARADA from Vamsee Fine Arts in July 2008. Besides regional associations, Sadhanalaya has also been part of the several National Indian Associations in New York. Students perform for the annual Deepavali Festival at South Street Seaport, the India Day Parade, IndiaFest in Long Island and also for Nassau County's Summer Concert Series. Pragati, a local ‘Working Indian Women's Organisation, the Telugu Literary Cultural Association, Kannada Koota, the AIA, the Indian Association of Long Island and also the Bharatiya Vidya Bhavan have recognized, through awards, both Sadhanlaya and Sadhana’s outstanding artistic achievements and contributions to the art form. Under her tutelage 55 students have graduated in Indian Classical Dance. She also teaches in the United Nations International School as part of her continued endeavor to reach out to diverse audiences and spread the rich culture and tradition of India. For Sadhana, dance is not just a form of life, but life itself!